This morning’s “Cycle To Work Rally” is a huge hit. Today’s bicycle rally is all about encouraging people to come to work on their bicycles more often. APIIC and Hyderabad Bicycling Club (HBC) conducted this rally. I reached venue by 7.15am and the registration process is smooth. Lines are fast reduced and well planned RSVP process completed the registration in a snap. Breakfast arrangements are good. The breakfast bag contained right kind of food for the occasion – nutrient, ample and diverse. Participation T-shirt is of very nice quality. Bike-Station and HBC arranged loaner bicycles for participants who want to use a temporary one for the day. Participants are engaged in a nice bicycle quiz till the participants complete the registration process and gather at the start point. Presence of V.V.S. Laxman is morale boosting. Smt. Gita Reddy (Minister, Andhra Pradesh) did the flag off. Both Sunil and myself from NetEnrich participated in the rally and we are glad to meet some of our college alumni members there. The rally covered 20km of hilly roads. Special traffic regulations and arrangements by Hyderabad Traffic Police are awesome. They ensured that the bicycle riders are not stopped at major signals and the rally is given ample road space thorough-out the 20km stretch. I took about an hour and five minutes to complete the ride. Sunil is faster, took about 55 minutes. Having put close to 40km on my bicycle so far in the day, my legs are cramped and my body is tired, but my heart is filled with joy. The joy of participation. Thanks HBC! Bicycling: its a hobby that does lot of good things to you. It is fun, burns fat, saves money and keeps you fit. You take it seriously for a few weeks and it really grows on you. Here are some useful links for bicycling enthusiasts in Hyderabad. One of the best things that has happened to Indian Cricket is V. V. S. Laxman. He steered India to many of the most unbelievable victories in test cricket. For over one and half decades, he made India’s test cricket worth watching. The middle order was never ruled out while he is out there. He is a combination of aggression and patience, displaying those contradicting qualities as and when required. His exit is untimely, his concerns are very understandable. Just like in his typical innings, he was patient enough when required and turned aggressive on his retirement. That made him more lovable. We all miss you V. V. S.! Time to take a look at the progress of my bicycling in the last 3 months. This month, I crossed the 250km mark. Its not much, but its a good progress in the right direction. My average bicycling speed has increased. The approximate time recorded includes a few minutes of warming up before the actual ride and a few minutes spent on winding up. Even with those factors, there is an improvement in bicycling speed. I may not be able to beat these numbers for the next couple of months, given the fact that I am traveling most of the days in the these two months. Our participation in Hyderabad 10K run increased from last year. We made 40+ registrations this year. We collected the kits and distributed them on Friday itself. The day started very cloudy on Sunday. I ended up staying awake the whole night and made an airport trip at 4.30am, returning home only around 7.00am. I made it to the venue along with Spurthi only at about 7.30am, barely making it before the 7.40am start date. Spurthi branched off to run with her friends. After the usual photoshoot before the run (we could only meet few of our coworkers in that huge crowd), we started the run. The arrangements made by Hyderabad Traffic Police are fantastic, as usual. The drinking water arrangements made are not as big as the previous years, but they are ample enough. Music bands at various locations upped the tempo during the run. 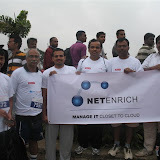 We made another photo shoot session at the finish line with the team members who did the complete run. Here are the pics from the run. Sunday evening’s short (about 5km) bike ride, to test my recently bought used bike. So far, I have been using bicycles without gears in my whole life. In the last one month, I started taking my bicycle out quite regularly. For more than two weeks, I am doing 6+ kilometers on my bicycle. Based on the positive effect of taking out my bicycle regularly, I started looking at what the local bicycle club members are doing. I found that they are doing anywhere between 10km to 25km on Hyderabad roads, which is quite impractical to achieve with my bicycle without gears. Most areas near my home are hilly and the flat areas a bit farther from my home. At the same time, good gear bicycles are quite expensive and I didn’t want to invest good amount of money upfront without testing the waters. Unlike in western world, there are not that many pro bicycle rental places in this part of the world. That prompted me to shop around for a used entry level bicycle with gears at a lower cost, so that I get a feel of what would it feel like. Based on one of the posts in Hyderabad Bicycle Club (HBC) forums, I contacted a bicycle enthusiast who is willing to sell his old bicycle. He recently bought a Cannondale and he is ready to part with his older one. The deal is done in the first meet and I brought home my first geared bicycle Friday night. This is a Raleigh Elevation 2.0, an MTB with 18 gears. I took the bike out on Saturday morning and had a very positive experience. I got a couple of accessories fitted with the bicycle (water bottle with a cage and a bell – a must thing in the crowded neighborhood I am in) and got the parts lubed and greased. Now the response of the bicycle is much better. Let me see if I can better my 6km mark with this bicycle. Sunday is the testing day. There are very few things that bring a smile on your face while you are reading a newspaper early in the morning. Especially with global economic fallout to riots in Britain to senseless political statements back home in Andhra Pradesh, we have very few reasons to smile. However, today’s print advertisement by Vaseline (facebook page here) brought a cheerful smile on my face. Big bat, small print, big impact. After a long time, I saw a clever print advertisement and followup social networking application that uses the current news effectively. Good job Vaseline team! I think Vaughan spent more time on how Laxman was declared not out rather than spending time on how to make Laxman out. Looks like he has great levels of past experience using which he could attribute that not out decision to Vaseline. The fight for spots two, three and four is intensifying in IPL-2011. The equations are changing by the day. Last night, I got a glimpse of the way Gilchrist and Marsh played in their match. Amazing strokeplay! Hope this level of entertainment continues in future matches. I have seen one of the best innings yet by Ambati Rayudu in the most recent IPL match. I am glad I went home late and ate my dinner while watching Mumbai Indians’ innings. His first boundary, a pull off a short ball that is well outside the offstump that eventually reached the legside boundary, spoke a lot about the aggression with which he batted for his next 60 runs. While the Master on the other side scored with precision, this guy remained the real Blaster of the day.